Nvidia has today announced two new Quadro workstation cards built using the company's new Pascal GPUs. The Quadro P6000 and Quadro P5000 are similar to their consumer counterparts, but feature increased VRAM and target professional applications. 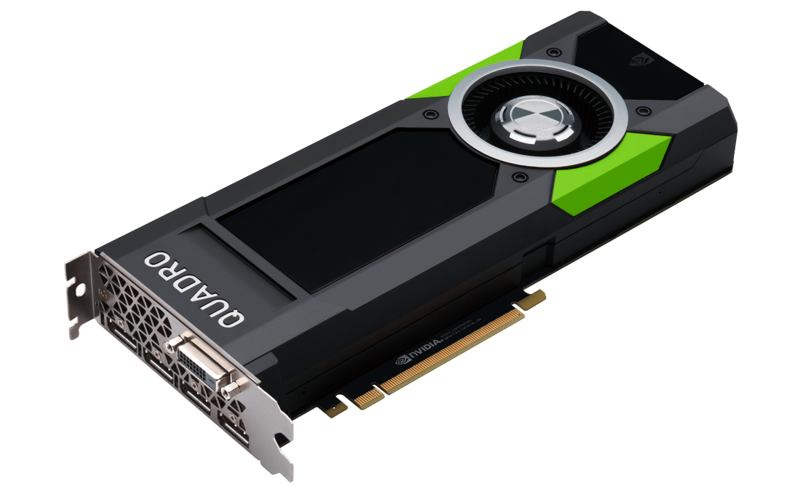 The Quadro P6000 is Nvidia's most powerful workstation card, featuring the same GP102 GPU used in the recently-announced Titan X. However, unlike the Titan X, the P6000 uses a fully-unlocked GP102 chip with 3,840 CUDA cores, providing a huge performance increase over the Maxwell-based Quadro M6000. While clock speeds aren't known just yet, the P6000 does come with 24 GB of GDDR5X on a 384-bit bus, clocked at 9 Gbps. The card has a rated TDP of 250W, although double-precision performance is limited to just 1/32 of single-precision, similar to last-gen cards. The Quadro P5000 is based on GP104, also seen in the GeForce GTX 1080. This card features 2,560 CUDA cores, and 16 GB of GDDR5X at 9 Gbps on a 256-bit bus. Like the GTX 1080, we're also looking at a 180W TDP, and the same double-precision performance limitation as the P6000. Both new Pascal-based Quadro cards will be released in October, although prices aren't yet known. Considering the predecessors to the P6000 and P5000 cost $5,000 and $2,000 respectively, these cards won't come cheap.